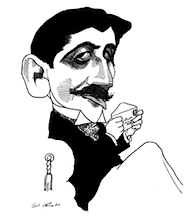 Today being the DAY of the DEAD I’m going to celebrate Marcel Proust, who is dead, among other things. Off and on for a couple of years now I’ve been wading through his massive masterwork: A LA RECHERCHE DU TEMPS PERDU and I’m a third of the way through the ten volumes in French. Odd that there are only seven in English but I’m told there are supplemental DVD-like features at the end of this, like motivational carrots. It takes a while to accommodate oneself to his detailed writing and, frankly, if my wi-fi hadn't been out, thus disabling Kindle, I would probably never have got this far or sunk sufficiently into the book to be able to appreciate it. It’s not because the book is so intellectually challenging that it’s hard to read. Rather, it’s the flowing style of interminable sentences with little punctuation and even fewer paragraphs that makes it difficult to follow. Every facet of an idea is explored which, while presenting marvels of observation and perception, slows the pace to something less than glacial. There are also stultifying passages showing off his knowledge of painting and art, interminable pages about color. He mentions PINK a lot, especially in regard to young women who are all sorts of variations of “rose et or”. This is particularly stuffy because he has obviously not heard that a picture is worth a thousand words. Or maybe he's trying to prove that his words are as good as, or better than, a painting. UPDATE: Finally finished the book on April 15, 2015 and found a detailed chronology of events and list of characters and breakdown of the plot which would have helped during the reading. I'm glad I read the whole thing, it gave me great insight into the French psyche, it showed that it's not always a good idea to write about every little detail you've ever observed. But I think he wrote that way because he knew he was dying and wanted to have a record of everything he'd seen and heard and tasted and smelled in his short life. This book made me think of all the people who didn't have Proust's gifts and their unsung lives. Like these poor folks who's only record is the marks made on their cannister coffins. Good on you for ploughing through that. Never attempted it, but I may. Gravity's Rainbow is my chosen struggle! :) How's writing? 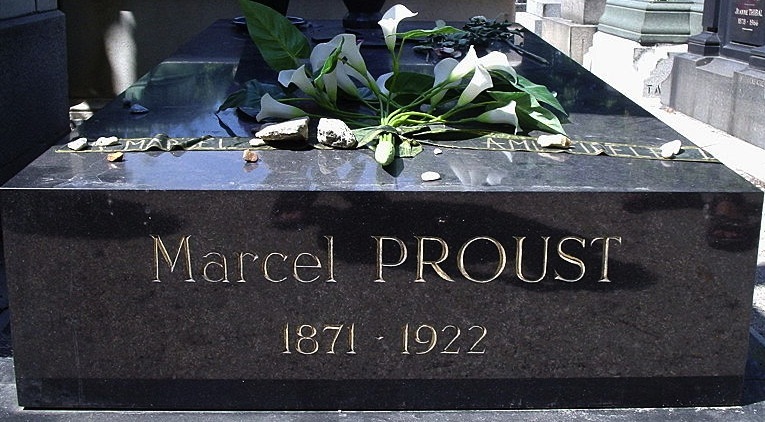 I'm willing to suffer for Proust but I don't know about Pynchon. I've put him on my list of cruel reads. By the way, like the David Levine of Proust. Love his work, and wish I had his flair. Actually, you do have a Levinian flair to your drawing. Vous avez eu beaucoup de courage de le lire dans le texte il est un peu oublie. Aussi penible a lire que Joyce mais quand il se met a ecrire clairement, c'est un grand plaisir.